Read the first conversation in this series here. Playing by the Rules is a series of three interviews that took place in summer 2016. These conversations emerge from my interest in further exploring a curatorial surfacing over the past year of work that relies on the language or framework of organized sports to address socially relevant and complex ideas. 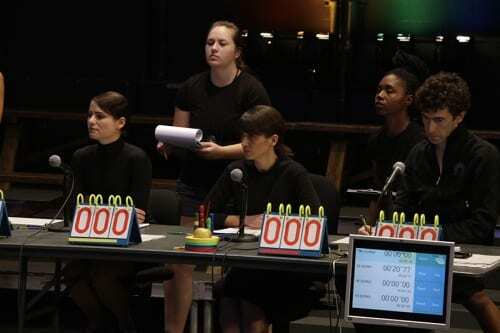 Although these themes emerge across artistic disciplines, the framework of games seems particularly relevant to the discourse of performance, brought to the fore in Sarah Michelson’s five-hour, four-day marathon performance, tournamento (2015), in which Michelson’s cast engaged in an ongoing, unique contest with uncannily familiar rules and scoring underneath jumbotrons and theatrical lights. The performative relation between both player and spectator is articulated in other forms. Background on the social history of organized sports, rooted in the industrial revolution, sheds light on the consumption of performance by European and American platforms and how metaphors of tournament and competition can be applied to artistic practice. The social constructs originally established through the democratization of public space and resultant architecture (for example, soccer fields and baseball stadiums) informed the way in which urban space was used and organized. The rules and implicated teamwork of organized sports brought a civility to competition and identification as part of a collective. These are concepts that have developed exponentially in Post-Fordist capitalism and, recently, have surfaced within artistic discourse. In the first conversation of the series, the film pioneer Ericka Beckman discusses her relationship to film and performance through two films from the 1980s, You The Better (1983) and Cinderella (1986). Through layered narratives and highly constructed performance sets, Beckman creates her own genre of performance and critique. In the following conversations, Cally Spooner will address the application of traditional rugby rules to the corporate environment in her recent choreographic work On False Tears and Outsourcing (2015). Mary Helena Clark will consider the body and spectatorship in Palms (2015) through the metaphor of the tennis tournament. The critical applications of the rules, aesthetics, and social constructs of sports are becoming a language through which one can analyze American contemporary culture—with seven percent per year growth between 2009 and 2013, the sports market has grown faster than the national GDP in most countries in the world.1 The manifestation of capitalism in organized sports is not a new phenomenon: local and national teams of sports such as rugby, cricket, baseball, and football are deeply rooted in the societal changes of industrial revolution, when young workers sought entertainment, physically activity and bonding after migrating to urban centers for menial, unskilled factory labor. This history of seeking a type of pure, universal distraction, a unifier as a disguised form of capitalistic nationalism, makes the structure of the organized sport a heady language for contemporary art practice. By applying the concepts established in game theory—which analyzes the mathematical models of conflict and cooperation between intelligent rational decision-makers—and a longer, more historical analysis of the role of games in society, the potential for critical debate is extensive. A side effect—one that is well-understood and applied by the artists interviewed in this series—is the way in which sports are unashamed enactments of affect, as described by Hal Foster in a 2014 essay in which he lays bare his own fandom of soccer by comparing the depth of emotion we expect to find in art and the seemingly more populist affect of sport.2 The glory of victory and the tragedy of defeat are emotions most readily engaged through a displaced identification with players. It is through sports, not religion nor art, that millions confront ecstasy or sorrow. This hearty emotional embrace has in the recent past put organized sports more at odds with the art-world denizens who ironically embrace being “bad at sports” ; the artist-interview podcast this very name has reached thousands of listeners. The interviews that follow delve into this outwardly uneasy but critically fluid language between organized athletics and formal performance and filmmaking.